Triton has supplied 3,280 kg of TT Admix, its BBA certified concrete waterproofing system, to a prestigious new build project in West London. The project is a new car dealership situated between the M4 flyover and the site of Brentford FC’s new stadium. The construction comprises a watertight concrete base slab with welded sheet piled walls and a watertight concrete capping beam to provide a Type B integral waterproofing solution to BS8102:2009. On top of the slab is a steel framed structure. 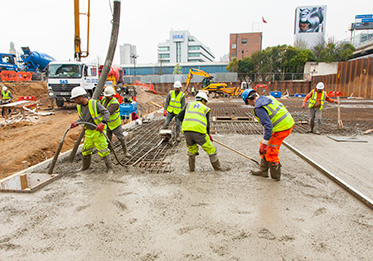 TT Admix was specified following discussions between Triton and main contractors, Harringtons Builders Plc, who were impressed by Triton’s site inspection regime and the company’s ability to cover all aspects of waterproofing, not just watertight concrete, under one technical viewpoint and one warranty. 800 4.1kg bags of TT Admix were supplied on completion of the job, around 120 of which were for the capping beam. The concrete was supplied by Quattro Readymix at a dose of one 4.1kg bag of TT Admix per m3 of concrete. The base slab was completed in three pours and the capping beam completed in four pours. All the construction joints for the watertight concrete slab pours were waterproofed using Triton’s standard detail with Triton TT Waterstop held in place with Triton TT Swellseal Mastic. The installation was inspected by Triton’s team for warranty purposes before any concrete was poured. The construction joint between the watertight concrete slab and the sheet piled wall was waterproofed in the same way. Triton produced a number of non-standard drawings for this project to fit the customer’s design to show the waterproofing recommendations, including proposals for the sheet piled wall intersection and for the capping beam.